that I don't know where to start. 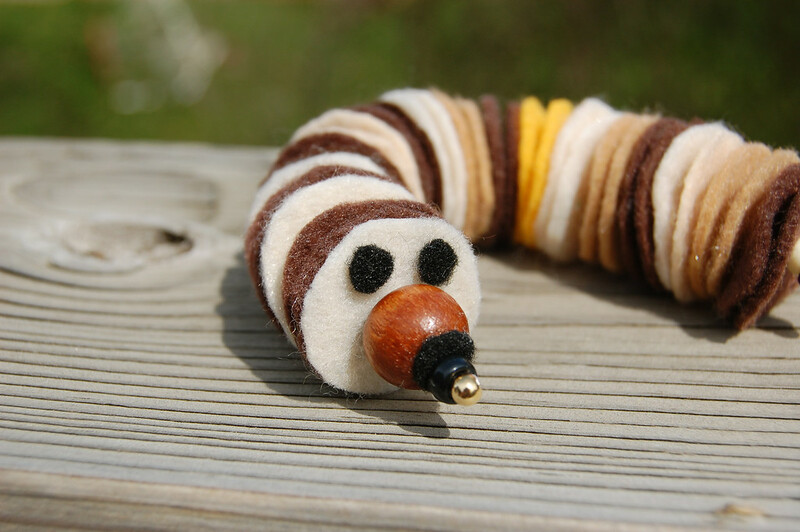 First, caterpillars make me feel very ill.
Next, I made this caterpillar because I was feeling sentimental. normally find in nature (scroll down to last photo to see). pleased, so I'm doing this for her. like using every last fabric scrap for something if I can. non-species-ist hearts, would think it was cool. more realistic and I'd have died before I finished it. Well, for those of you who are saying, "but it's cute!" Some felt circles - I used about 34 but the number is unimportant. Small beads of any shape, although squat is better than long - mine were 1/8" in diameter. Other larger miscellaneous beads for the tail and head. Scrap felt for the eyes - I used black. Double a length of thread through the needle and knot the end. I made a humungous and untidy knot for visibility's sake, but you should make a small, neat one. 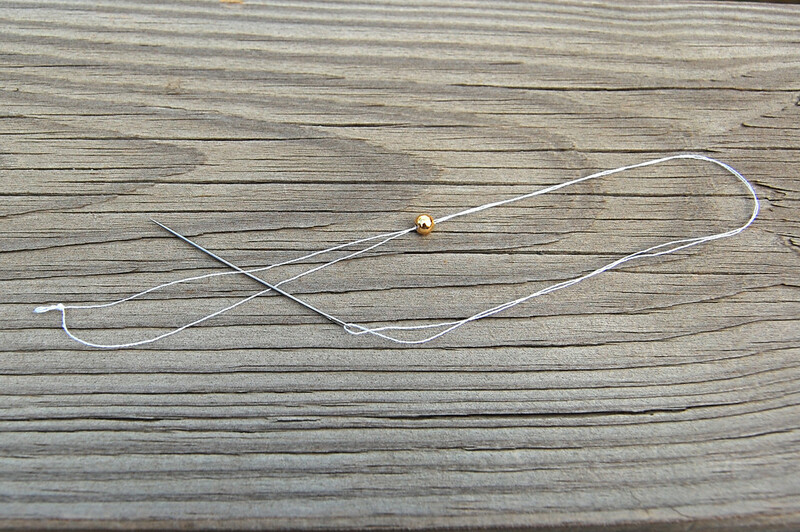 Thread one bead and pass the needle between the two strands, and between the bead and the knot as shown above. 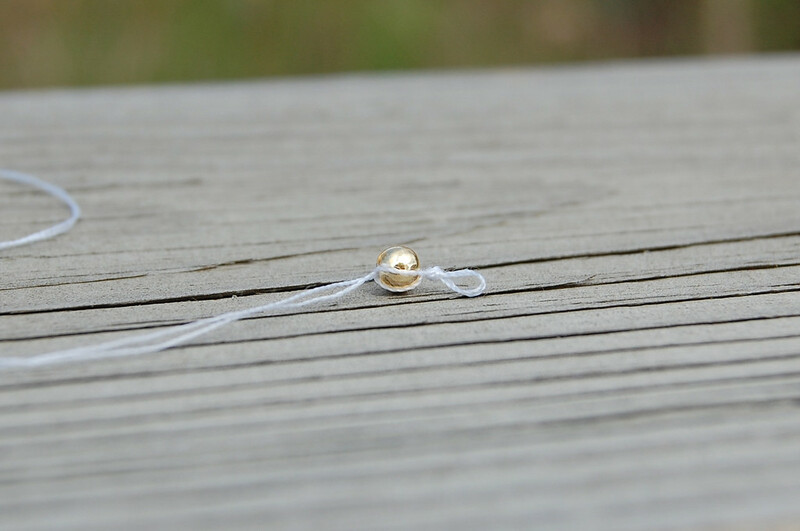 Pull to tighten - you now have a securely-threaded first bead. 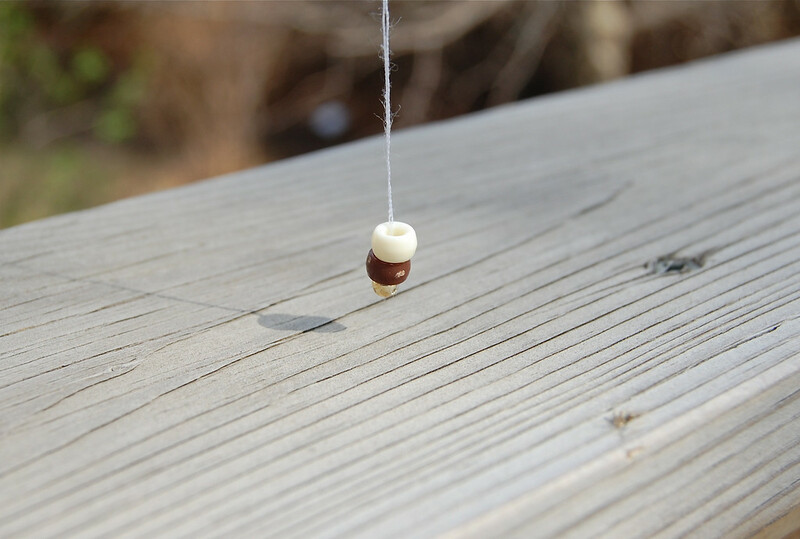 String on a couple of bigger beads, like these pony beads, to make a short tail. 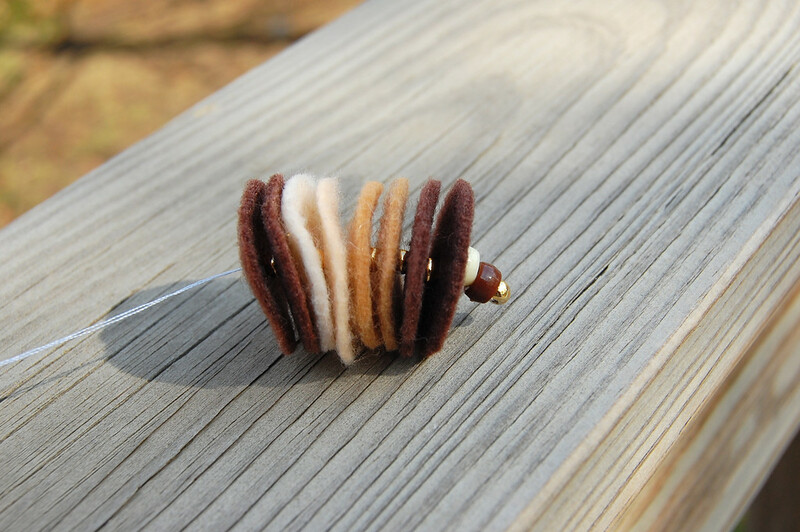 Begin making the body - poke the needle through the center of one felt circle, followed by a small bead. 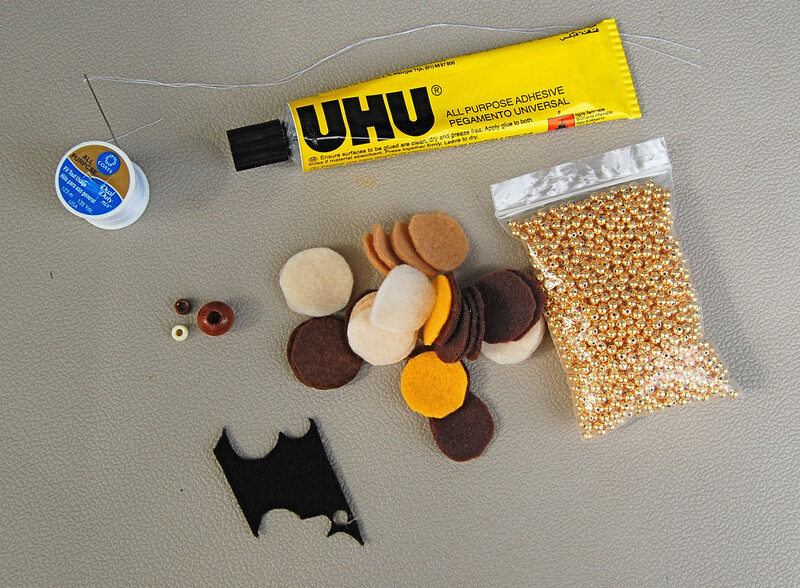 Continue alternating felt circles and beads until you have used up all the felt circles. 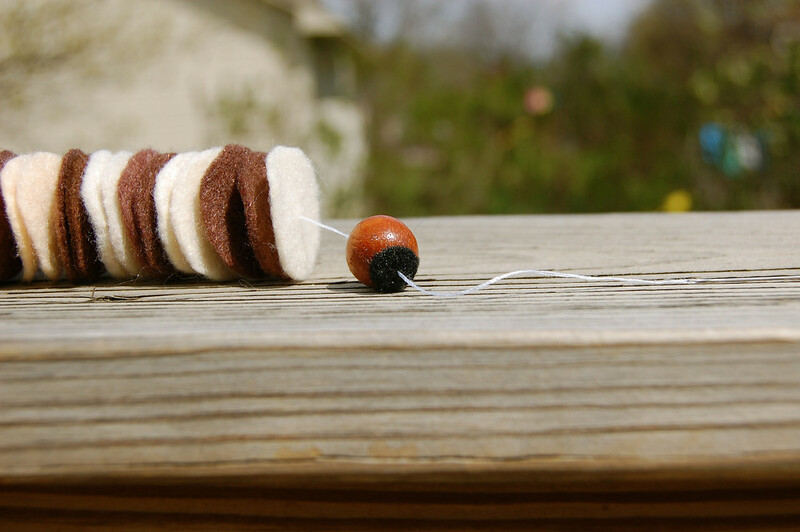 To make the had, thread the needle through the hole of the large bead. I cut a tiny felt circle and stuck it over one of the holes of the bead because the hole was a bit large for the smaller beads that were going on next. This acted as a stopper of sorts. String on as many smaller beads as you want to complete the head. I used a small pony bead and one of the little gold beads. and through a few of the felt circles. Pull to tighten. Knot the thread here and cut off the excess. Cut eyes from felt and glue on. rather unrealistic colors, and thus safe. Flickr group. I fear I will have to politely decline. love the post!! so funny and enjoyable! Thanks! Love the pinkish tones caterpillar! Only children can make a caterpillar of those colors! thanks! I think my kids will enjoy this. Oh that IS creepy! My grandfather used to pull those huge hot dog-size ones off his tomato plants and chase us around with them. Traumatizing. I love the project though! I'll be linking. Supremely creative AND suprememly funny. L, you are a rare find!!! What a great idea.....I know what you mean by a little creepy but so very fun and cute. 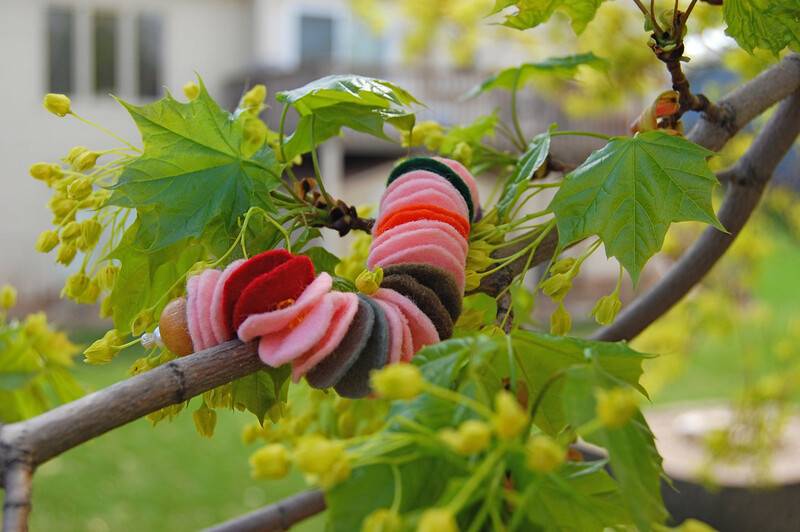 Great way to use up felt scraps! I'll make one for my kids! so i did this with preschoolers this past week.. amazing!! love love loved the time i got to spend just talking and sewing with them. thanks for your GREAT post and i linked ya! happyday!! I love your blog sooo sooo much. Thanks for the ideas. 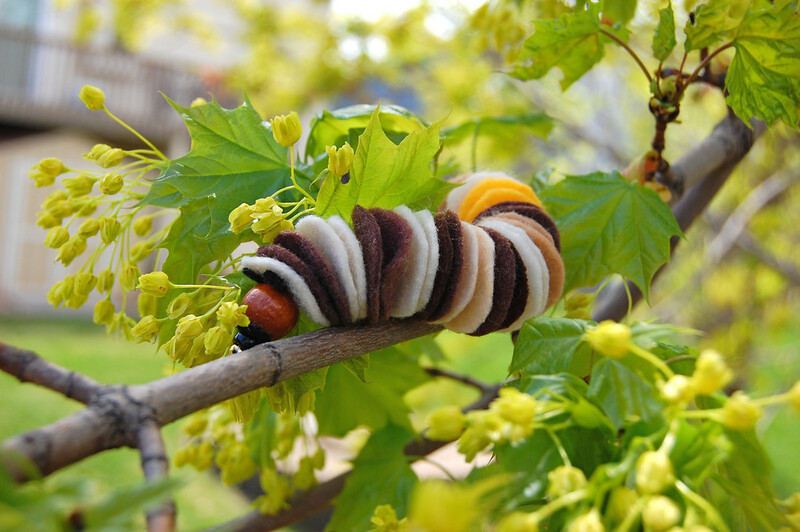 I'll be making this with my kindergarten class next week as we wait for our caterpillar to emerge from his cocoon and turn into the much anticipated monarch butterfly. Can you believe that something so creepy turns into something sooooo beautiful? I just found this and it was exactly what I needed to finish my craft project. Thank you. I'll add you to my blog roll and be popping back regularly.